One of the best things about going feet-first into the yarn business, and one I didn’t anticipate at all, is getting to know and work with a wide range of talented, creative, determined independent fibre artists: indie pattern designers, hand-dyers, knitters and shop owners who are artists in their own right. I’ve been in awe of the spectrum of ability and the passion for fibre encompassed by the women I’ve met so far. Having worked almost all of my life in male-dominated fields, it’s like getting a huge breath of fresh air. The interactions I’ve had with the yarn have all been positive, supportive, respectful and fun. This is not to say that there aren’t men out there who can do that, too, just that I didn’t encounter many in my previous lives. I must have been looking in the wrong corners. And then it hit me: I’m an indie, too: someone with a passion and a vision that is outside the usual commercial model, who is willing to take risks but also to work collaboratively with others of like mind. So here’s to all of us indies that are associated with White Gum Wool in some way or another. Over the next few months, I’d like to profile the different individual indies that I’m working with. The numbers have grown pretty fast, and I won’t have space in this Yarn to do more than just introduce you to them and give you the links so you can go and see the amazing things they are doing. I think you’ll be impressed. Most of them are on the Ravelry site, which is absolutely worth joining. It’s a lovely network of crafties, with squillions of project ideas—things people are actually working on, not just fluffy theoretical things. I need to start with my three main shop owners: Penni Castellana of The Stash Cupboard in Hobart; Cheryl Attenborough of the Salamanca Wool Shop, also in Hobart, and Debra Cadogan-Cowper, who runs the Tasmanian Wool Centre in Ross. All three are passionate about fibre and about getting the word out about the wonderful qualities of wool. They have been incredibly supportive of White Gum Wool and have moved quite a lot of yarn into the hands of knitters and crocheters over this first year! Right behind them are my pattern designers, first Justine Turner from NZ, then Georgie Hallam here in Australia, and recently a new Australian designer, Restless Knitter. They have all taken to White Gum Wool with great enthusiasm, and there are now several patterns specifically designed to be used with my yarn, as well as others that have been adapted to use WGW in addition the original yarns specified. If you have ever tried to create your own knitted item, and then document it for someone else (I did try this a few months ago, and it ended badly—swear words and tears), you will be as awed as I am at what these indie artists do: conceptual design, 3-dimensional trials (many times over), geometry, mathematics, editing, marketing. And then there are the indie dyers. What an amazing group! The first to use White Gum Wool was Rebecca Robinson of Augustbird. I’ll come back to Rebecca in a moment, because she has just launched a gorgeous range of multi-coloured yarns to go with my solids, and I’d like to share those with you. Other indie dyers, roughly in order of their appearance on my radar: Anais Yarn, Travel Knitter (UK), Colour by me/tres/, Miss Jane Knits, Yarn vs Zombies (there’s a cat involved, not exactly sure how), Gradient NZ (but in Australia), Nunnaba and a few more that are thinking about it, including Solar Flair, Red Riding Hood Yarns and Koru Designs Aotearoa (both NZ), and Angie’s Studio. Nunnaba’s “Frozen” colourways, also just released. Colour by me/tres/ Forest Fairy, still on the dyeing frame. The wonderful thing about indie dyers and White Gum Wool is the huge variety of colour that is now available. I decided to stop with 14 colours—plenty to manage in terms of inventory and with a limited wool production. But you don’t have to be limited to my colours now, and wait till you see what these indies are up to—some absolutely fabulous designs. And last, but by no means least, my one indie knitter—well, actually Emma is both Em’s Knits and also part of a collective (ELKS), so there are four of them. Em and her friends are registered knitters, so they have been vetted, for instance by pattern designers Georgie Hallam and Kelly Brooker (Pekapeka), as knitters who can make various items for you, if you don’t have the time, or the skills. Colour by me/tres/ (Agnes Bolton)’s new range of gradient colours. This is Forest Twilight. Emma of Em’s Knits will be turning this into one of Kelly Brooker’s “Just One” gradient cowls. 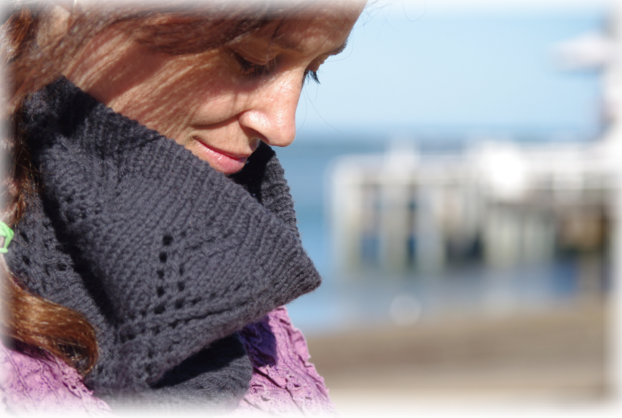 Em’s Knits: 8-ply WGW in silver wattle. Don't these just make you want to get your needles out and cast on? !